SAN DIEGO -- Looking around Dyan Diamond’s College Area home you can tell she is a dog lover. “She was my best friend,” Diamond said. Torrey was the dog of her life. Dyan got Torrey certified as a therapy dog to help others. “We went to nursing homes and children’s hospitals,” Diamond said. Torrey was literally a poster dog for shelter adoption. “We also had like t shirts made and posters and all kinds of things,” Diamond said. Torrey died a few months ago. “It devastated me,” Diamond said. “She was all I had,” Diamond said. On Monday, while Dyan was at work, someone broke in the house and stole some wine, money and a wooden box containing Torrey’s ashes. “It could have been that they thought it was filled with jewelry,” Diamond said. 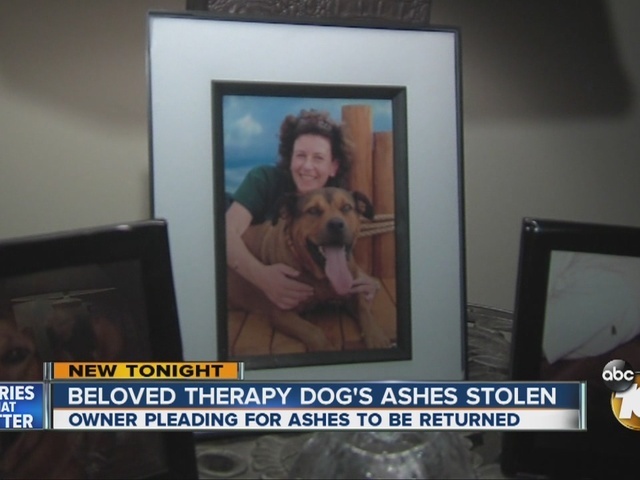 Dyan said the thief came in through a dog door and made it past her three other dogs. She just wants Torrey’s ashes back. “I would give anything to have her back,” Diamond said. The wooden box has a small lock and a heart-shaped tag with Torrey’s name on it. Dyan wants anyone who finds the box to leave it on her doorstep, no questions asked, or email Emily.Valdez@10news.com .